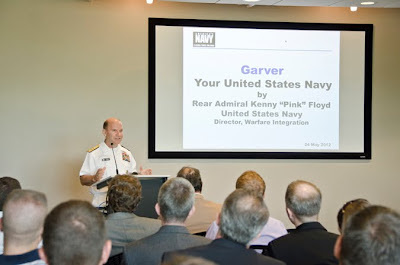 United States Navy Rear Admiral Kenneth Floyd visited Garver's headquarters in North Little Rock, Arkansas on May 24. Rear Admiral Floyd is on an outreach campaign to share with land-locked states the U.S. Navy's ongoing mission to serve and protect on, over, and under the sea. 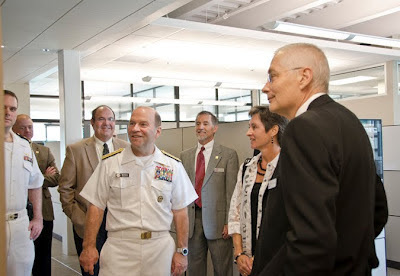 Garver was honored to welcome Rear Admiral Floyd. Garver President and CEO Brock Johnson led Rear Admiral Floyd on a tour of our facilities and introduced him to Garver's services. Afterward, Rear Admiral Floyd met with a group of engineers to talk about the U.S. Navy, which he referred to as the United States' "Away Team." "You can be confident that we are out there," Rear Admiral Floyd said. "[U.S. Navy sailors] operate as a team, they're disciplined, and they're committed to each other and to accomplishing their mission. They're there to stand up for and defend this country as required." Rear Admiral Floyd talked about the U.S. Navy's many missions and capabilities, from providing disaster relief efforts to pursuing energy innovations that benefit war fighting to keeping the seas free for more than 200 years. And as unpredictable and diverse challenges rise up to face the U.S. Navy, Rear Admiral Floyd said they will continue to be on the seas doing their job. Rear Admiral Floyd is the acting director for the Office of the Chief of Naval Operations Warfare Integration. He participated in Operation Desert Storm and Operation Enduring Freedom. His awards include the Legion of Merit, Bronze Star, Defense Meritorious Service Medal, Meritorious Service Medals, Air Medal, Navy Commendation Medal, Navy Achievement Medal and various campaign, unit, and service medals.